raveling doesn't have to be as bad as everyone makes it out to be. Sure, it's not 1940 anymore and you can't drive your car to the tarmac. You won't be greeted by a fashionable, all-female crew and be served fine cocktails prior to take-off. You can't smoke on the plane, and you can forget about the mid-flight tour of the cockpit. Things have changed. The biggest change to air travel, I think, is the fact that it's priced to be accessible to more people. That means crowds; hoards; throngs of people all clamoring to clear security, board, be served, clear customs, etc. The great unwashed masses have joined you on your trip. It's no surprise that you'll often be flying on an "Airbus"; pretty much sums up the experience. So what can be done to make the experience better? International Flight "Buy one, get one" program. Buy an international business class ticket and get one free (for someone you're traveling with on the same flight). I did the math - it's pretty much like a free business-class upgrade for two people. Free access to Priority Pass. Yes, you can buy this on its own for anywhere between $100 and $400, but no need if you have the Amex Platinum Card. This rewarding pass gets you into 600+ airport lounges worldwide. More on this importance later. Free registration for Global Entry. Never heard of it? Most haven't. It's a program run by US Customs that allows kiosk re-entry through Customs upon return from an international trip. You go to an interview, get your fingerprints scanned, get a sticker in your passport. While everyone else is in queue, you scan your fingerprints, complete a short on-screen questionnaire (no awful Customs forms on the plane!) and stroll through to baggage claim. $100 registration fee, paid for Amex Platinum Members. $200/year of airline fees refunded for a domestic carrier of your choice. Choose American. Choose Jet Blue. Choose any one of a zillion carriers and be done with stupid luggage fees, meal fees, etc up to $200 per year. You can change that preferred carrier each year as you please. Takes lots of stress out of things when you get slapped with a stupid fee and you just don't care since it's paid for. Concierge Service. Call them to book your travel. Call them to book your restaurant. Call them to get you tickets for a sold out show. Once you get used to using it, you'll use it for just about everything, and it becomes indispensable. Especially if you missed a flight or lost your luggage and you need help. Tools alone will not alleviate the stress of travel - you need to know how to use them. Some practical tips, now on how to make good use of them. Dressing for travel: Proper travel attire is important. Yes, you need to look nice if anyone is going to take you seriously. Next time you travel, keep a close eye on who gets that free upgrade to Business Class. Does the airline want frumpy people up there? No. 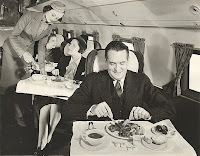 Besides, free upgrade or not, dressing well lends credibility to any interaction with the airline employees. The guy in the sport coat is going to get the seat assignment before the guy in the sweats. He'll also be served when he walks up to the counter with a question. Don't overdo it; you want to be comfortable. But no sweats or grungy looking clothes. Nice luggage helps too. Airport lounge. Soothes the weary traveler. Getting to the airport: Few people want to get to the airport early. There's a reason for that: The food is awful, the crowds are annoying, and the waiting area seats are as comfortable as 16th century church pews....if you can find an empty one. You get to pay for internet too; your savior for the boredom of waiting for your delayed flight. Not you, though. You can't wait to get to the airport early. 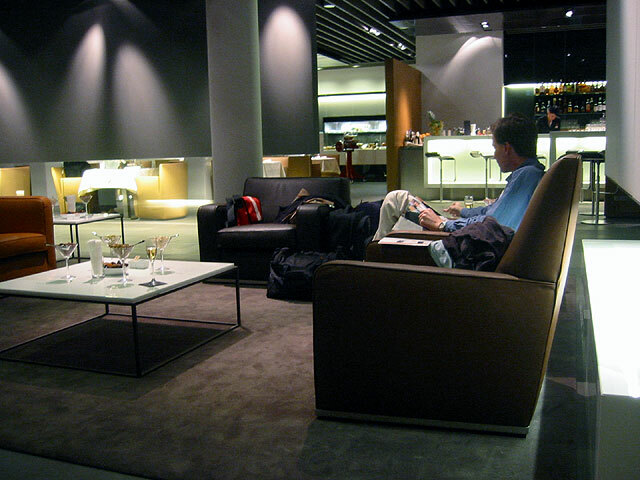 You have Priority Pass which can get you into any number of airport lounges at practically any airport. This means free internet, free food, often a complimentary cocktail, sometimes massage services and showers. All in peace and quiet. 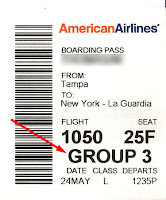 Some are "land side" (before security) and some are "air side" meaning after security. So take your pick where you want to relax before your flight. When travel plans go awry, this is where you go to use your computer, call airlines or the travel concierge and work it out. 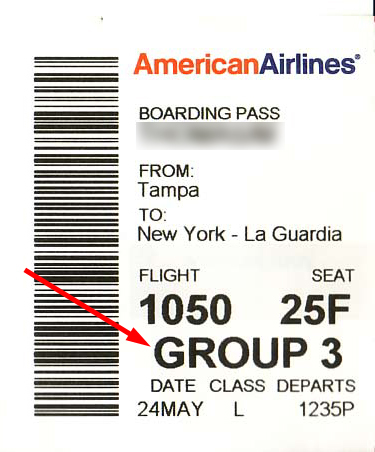 Seat Upgrades: When you check-in at a kiosk, you're often presented with some seat upgrade options. For $20, get the exit row with more legroom. For $135, get a larger seat and preferred dining service. I'd highly suggest you use these to your advantage. They typically aren't much money, and it's the little things that exceedingly improve your trip. Just don't pay to board early (unless you have kids or something). See this? Now ignore it. Boarding: Which brings me to boarding. I think it's most amusing to watch people clamor and fight to get on the plane. It's as if the overly cramped space and dry air offers something more than the dreadful terminal. It doesn't. Also, there's no reason to be in a hurry to sit since you're going to be doing lots of that for the eight-hour flight. So be the last to board. They called your row first? You don't care. They're not going to halt boarding because you didn't get on first. Doesn't matter where you sit - window or aisle, front or back. Be on last, and enjoy the peace of having most everyone else seated. You also stow your luggage last, which means people will not be shoving it around to fit their oversized bag on top of yours. Attitude: ...is everything when flying. You have to be super zen. Might miss your flight? Don't run, there's a million other flights and the airline will work it out. Flight delayed? Perfect for an extra cocktail and another massage at the lounge. Be kind and polite to airport staff. Whatever stress you think you have, they have to bear it everyday with airlines cancelling flights, delays, and angry customers. They'll help you more if you are patient and courteous. I have found that a calm attitude makes everything work out....and I haven't missed a flight yet. Airport Pickup: Yes, it's more expensive than a bus or a train and even a cab. But when you land, and your mind is all jet-lagged and you can't speak the local language (much less your own) it's highly comforting to walk out of the terminal and see someone with your name scrawled on a board. You typically pay in advance, so there's no haggling or worrying, you just get in the car and go. So if you can book it or if your hotel can book it, do it. Worth every cent. Other Small Things: Keep about $50 for each of a number of currencies (Dollars, Euros, Pounds, Dirhams, whatever). 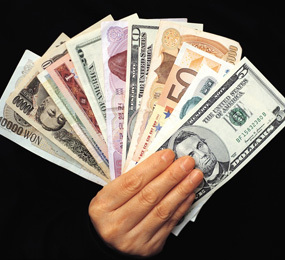 When something goes awry, you don't want to worry about where to get cash or where to exchange it. Keep small packets of tylenol or advil with you at all times. Hint: it's cheaper at your local pharmacy than it is at the airport. Easy to carry, priceless when needed. Specify a low-sodium dietary need. You're traveling in one of the driest environments short of the Gobi Desert, and the last thing your body wants is salt. But they use a lot of it in airline food in an attempt to make it palatable. These are just a few tips to negotiate this modern world of travel. I have others, and look forward to sharing them with you another time! my Delta Platinum Amex card is only $98/yr plus my Green Amex fee of $35. Sr Citizen discount and I get one free coach companion ticket at renewal each year. Baggage fees are waived on Delta Flights. Don't need lounges as have no time for them between flights. "Be on last, ..... You also stow your luggage last." you better make sure your carry on is small or you may not find a suitable spot to store it!